The LSAT helps individual leaders and leadership teams identify their safety leadership strengths and pinpoints areas that need development. 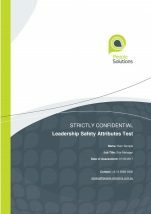 This insight and understanding into their own behavioural style empowers leaders to better target and drive safety culture change. ‘Motivating for Safety’ – “Inspiring”, “Supporting”, and “Innovating”.